With DeSean Jackson reporting to camp at Lehigh, worrying can end about the ramifications of what I considered to be one of the least worrisome holdouts in recent memory. Jackson is, by NFL standards, ridiculously underpaid. As a budding star, he deserves to be compensated better than the long snapper. Gaining whatever leverage he could from holding out affected nothing about the season. We didn’t really want DeSean getting hit and potentially injured in meaningless practices anyway. And there was never any doubt in my mind that he’d eventually report. The more interesting question now is how long it will take for the Eagles to give him that new contract. The team told the press that they wouldn’t negotiate with a player holding out. Now there’s no such excuse. Discussions should begin immediately, if they haven’t already. On one hand, the deal should get done quickly. The market for an established, young, number one wide receiver is set. Look at the numbers for the latest contracts and the age at which these wideouts signed. Santonio Holmes (27): 5 years, $50 million, $24 million guaranteed. Miles Austin (26): 7 years, $57 million, $18 million guaranteed. Brandon Marshall (26): 5 years, $47 million, $12 million guaranteed. Roddy White (27): 6 years, $48 million, $18 million guaranteed. White got his deal in 2009, and the average was $8 million. Last offseason Marshall and Austin averaged $9 million a year. Holmes extracted $10 million per season from the Jets a week ago. 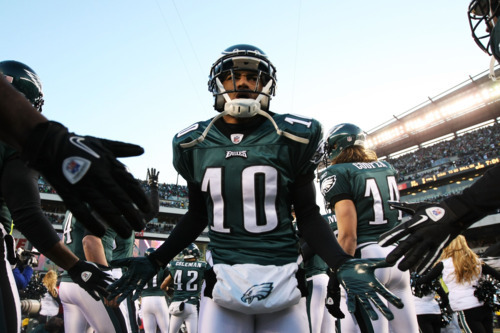 I would expect about $10 million a year for any contact extension DeSean would sign. That’s the easy part. An even bigger problem could be the length of the deal. Jackson is only 24, younger by two or three years than his comparables. The Eagles, given the risk they probably feel they are assuming with a large contract, will want control over all of DeSean’s prime years. Jackson will want the opportunity for another payday down the line. Here are my guesses. Given the market, I expect Rosenhaus to start with a deal that would beat Holmes: 5 years, $55 million, $24 million guaranteed. The Eagles first counteroffer might be more like an updated version of Austin’s contract: 7 years, $60 million, $16 million guaranteed. A fair deal might be something in the middle, perhaps 6 years, $60 million, $18 million guaranteed, although a lot depends on leverage in the negotiations. DeSean won’t want to risk injury without a payday, which the Eagles can basically force him to do. But the Eagles don’t want to lose Jackson in free agency next year. Something’s gotta give. Tagged with Philadelphia Eagles, NFL, DeSean Jackson, Drew Rosenhaus, Contract Extension, Contract Offer, Santonio Holmes, Money, Miles Austin, Brandon Marshall, Roddy White, Training Camp, Holdout, Negotiations, Wide Receivers. August 8, 2011 by Brian Solomon.